Clear and transparent rules on bonuses and promotions. Party Casino emerges from one of the most established online gaming entities worldwide, and in this review we will be outlining the ins and outs of this notable player in the field of online gaming – which has since also done its best to adapt to mobile technologies, as our Party Casino mobile review will demonstrate. Boasting a mix of live casino games, a wide selection of slots and gaming licences from Gibraltar and the UK, this casino does good on the legacy of its parent company, PartyGaming, which has been around since 1997. This casino may have a vintage provenance, but its current iteration certainly looks and feels as modern and slick as ever. On its homepage, this casino announces itself to new players as an accessible platform that is all about having seriously good fun. 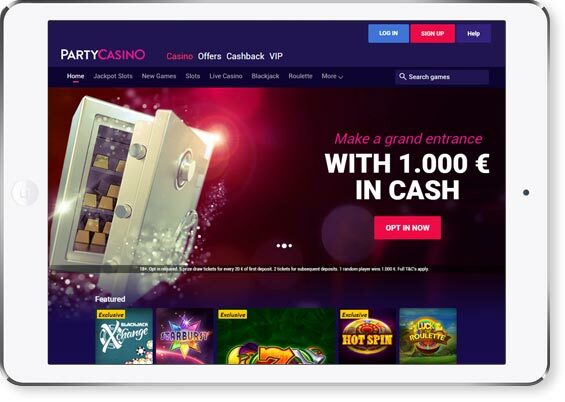 Part of the prestigious PartyGaming stable which was first set up in 1997, Party Casino is a spin-off of that developer’s casino branch, first launched in 2006. As this casino review will go on to show in some detail as you read on, this veteran developer has made sure to populate their casino with a varied array of games, with both live games and slots being adequately represented at Party Casino to the benefit of a diverse population of players who may wander in through their digital doors. We say ‘adequate’, because while the game count at this casino is not slim, it cannot compete with the larger website. However, this casino offers a great interface to play in, and comes with a guarantee of security that is hard to beat. Read on to find out what else you can expect from this long-running gaming platform in our review. As already mentioned in this casino review, the casino’s site has a great and easy-to-use interface, which makes logging in or signing up to the casino doubly easy and hassle-free. Just follow the signs on the sleek website to create your account – that would be the red ‘Sign In’ button on the top-left corner of the screen. This will lead you to a simple three-step procedure. You will first be asked to insert your preferred email address, name and surname, and your country of residence. Next, you will need to choose a username and password, pick a security question and identify your currency of choice. Finally, you will be asked to insert your address and mobile number, and you’ll also be asked whether or not you’d like to receive updates on future offers and other news from Party Casino. In this step of your account setup procedure, you will also be reminded of a very important legal requirement: players must be 18 years or older to play games at Party Casino. What is also great about this casino in particular is that it makes players feel even safer during the registration process by reassuring them that more information on the procedure is just a click away. On the bottom left-corner, prospective players will be guided to Frequently Asked Questions. Players have become quite savvy when it comes to hunting down the most lucrative casinos that reward newcomers with enticing bonuses to help kick off their experience. Having been around for so long, the people behind this casino are certainly aware of just how important bonuses are to players, with generous welcome bonuses clearly announced on the website’s landing page. However, in line with the fair and transparent approach that this casino adopts in all areas, the eye-catching announcements are accompanied by important disclaimers which make sure players are informed of important terms and conditions. Getting the full lowdown on these promotional offers is also quite easy – just click on the ‘Offers’ link on the top right. This will show the player a full breakdown of what can be expected from each welcome offer, along with the full terms and conditions that apply. With plenty of gaming experience under its belt, this casino is accustomed to treating its players well. This is evident when the user clicks their way to the ‘VIP’ link on the top-right corner of the homepage to find out more about what’s on offer for loyal players. The stylish interface of the VIP page already makes it clear that Party Casino is keen to give a premium service to its most loyal players. But this isn’t some elitist, inaccessible option. Party Casino has made it clear that all one needs to qualify for the VIP treatment is to, simply, be a great player. Party Casino ensures that no great players are left out and informs them of their VIP status imminently. With the help of dedicated Personal Account Managers and 24/7 Support, players can rest assured that they can be taken care of during their VIP experience, which includes special bonuses and rewards, tailored cashier service and even invites to events like Oktoberfest, the UEFA Champions League, and trips to Las Vegas. This casino has a generous roster of 160 games at its disposal, ranging from classic live casino games to a selection of slots. As mentioned earlier in this review, this is small fry when compared to what’s available on larger casinos. However, players are bound to find something they like at this casino, which covers the main bases pretty well. That includes Table Poker, Video Poker, Keno, Roulette, Blackjack, Bejeweled and Virtual Racing. Video Slots are also generously represented at Party Casino, with some flashy, eye-catching and familiar tie-ins like Jurassic Park, Monopoly, Dead or Alive, King Kong, and Jack and the Beanstalk lighting up the proceedings and giving a warm shot of modern colour side-by-side with the classic card games and live casino options, which in turn continue to give the casino the classic vibe that remains its mainstay. What is also notable about this casino is that it runs on its own unique in-house software, which conforms to the aesthetic of the PartyGaming umbrella and makes for a smooth and pleasant gaming experience, including on mobile devices as we explain in the Party Casino mobile review. As mentioned earlier in this review, here is a platform that has seen some years, and will have grown accustomed to servicing a wide variety of players with varied preferences when it comes to payment methods. To this end, this casino certainly accommodates a vast range of deposit methods but does not accept all of these options as withdrawal methods. The most expedient of the bunch is Neteller, which ensures that funds reach you within 24 hours, while the others will require five to eight days. Some of the other deposit methods may still be used as withdrawal options, but these are often subject to additional conditions. As with everything else, taste and preference will be subjective in the world of online gaming. Some prefer blackjack, others will prefer slots. Some will be put off by this casino’s comparatively narrow selection of games, while others will not be phased by it. But one thing we can all agree on is the importance of safety and security during our gaming experience, and in this review we are glad to inform you that the casino is certainly a safe place to play. On this count, Party Casino enjoys certification from authorities in both London and Gibraltar, while also operating on state-of-the-art 128-bit encryption software which ensures that your information is fully sealed and impenetrable. Customer support is yet another area in which this casino excels, giving players around-the-clock service that ensures peace of mind all throughout play. As this review confirms, players have at their disposal a 24/7 customer service offered by the casino, which they can contact through the live chat function or via email. Should players prefer to chat to a representative over the phone, this casino offers a toll-free service to several countries. Players from other countries can still get in touch through Party Casino’s international number, though at standard international rates will then apply. Determined to keep up with the times despite being a casino that is long in the tooth, Party Casino has made sure to have a dynamic and thoroughly satisfying option for players who want to experience the casino on the go, as this review will show. This casino is available on all major mobile or tablet devices, be they Android, iPhone or iPad. What is good news for fans of the Party Casino who are keen to take their experience on the go is that the mobile option offers a more than adequate imitation of the desktop experience. Ease of use becomes an even more urgent necessity when considering gaming on portable mobile devices, and in doing our research for this Party Casino mobile review, we were glad to discover that the registration and login process for the mobile version of this casino was as smooth as it was for the desktop version. Just insert your details by following the handy three-step procedure, fully in the knowledge that it makes for a secure transaction of information from start to finish. You’ll be playing your favourite games on the go, and in no time! Once again proving that the “If it ain’t broke, don’t fix it” approach is certainly something that the team behind this casino take on board when it comes to running their casino, players will find that the mobile and desktop versions do not differ from each other when it comes to the selection of games available. Powered by the aforementioned in-house interface purposely designed by PlayGaming, the mobile version of the casino snugly accommodates all of its titles onto the portable platform. In putting together this mobile review, we have discovered just how smooth the transition from desktop to mobile will feel for players shifting from one to another, and we’re also certain that those starting out on the mobile version of the casino will not feel in any way disappointed by what they find on offer. Bringing the timeless vibe of the most stylish of land-based casinos into the 21st century, PlayGaming gives gamblers a solid run for their money at Party Casino. As this review has set out to show, the casino does have a low game count when compared to other giants. But what it lacks in the simple size of its gaming roster it more than makes up for in sheer style. Starting off from their warm and welcoming landing page, and continuing on to its generous bonuses and commendable treatment of VIP players, this casino radiates a truly classy vibe. Coupled with its airtight security measures and great customer service, it retains all the makings of a solid casino to keep returning to.